Onirim is a solo/cooperative card game: you must work against the game, and find the oneiric doors before you run out of cards. In both cases, you will have to deal with the slithering nightmares that haunt the hallways of the labyrinth. 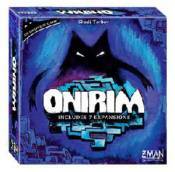 this new version of Onirim includes a total of seven expansions and one appendix.